Dec. 4, 2017 - A sawmill in Ontario that was first running in the late 1800s is now producing specialty products and supplying high-quality timber to the province’s cottage industry. Muskoka Timber Mills is tucked in amongst the cottages just outside of Bracebridge, Ont. Bracebridge is the heart of Muskoka Municipal District – well known across the province as cottage country. For years, Torontonians have fled the city’s concrete core on weekends, migrating to the lakes of Muskoka to take in nature. The original sawmill ran until the mid 1900s when it was shut down and turned into a lumber store. Singor came on board in 1992 to restart the mill. It was his first venture into the forest sector. Today Muskoka Timber Mills employs about 50 people in total and is a one-stop shop for custom products capable of sawing, drying, moulding, millwork, and pre-finishing. The list of products includes but is not limited to siding, flooring, reclaimed barn wood, timbers, thermally modified wood, and trims. The mill cuts in total between five and six mmbf a year with logs sourced from the Westwind Forest in Ontario and some white oak and American poplar shipped in from the U.S.
Muskoka Timber Mills also markets its residuals including bark, mulch, sawdust, and woodchips, as well as Miracle Mix, a carefully guarded recipe for soil enrichment. Chips are treated in a Fecon wood mulch colorizer and sold as black and red-dyed mulch. The mill sources local white pine, red pine, spruce, and hemlock for soft woods, and then hard maple, soft maple, yellow birch, red oak, white ash, cherry and beech hardwoods. “If it grows in this area, we cut it,” Singor says. All logs are from crown forests up to 200 kilometres away. Saw logs are stored at Muskoka Timber Mills log yard, which is kept wet in the spring, summer and fall via sprinklers. Similar to a log boom, the water from the sprinklers keeps the spores away that cause log stain. Last year Ric Singor turned to Viessmann to supply a boiler system that would help the mill better utilize high-quality kiln-dried hog fuel. The speciality sawmill, one of 10 buildings on site, is able to cut up to 32-feet long, 25,000 bdft a day. Prior to entering the mill, saw logs are first treated to one of two debarkers, a Morbark and a Cambio. The debarked logs then head to a Cleereman carriage. Other equipment in the mill includes a McDonough headsaw and resaw, Morbark edger, and a TS trimmer. The reman area includes a Weinig moulder and rip saw, Waco resaw, Friulmac End Matcher, Brute defect saw and Yates planer. The mill uses four Nyle dry kilns that can dry 100,000 bdft a week. Muskoka Timber Mills does not have access to Ontario’s natural gas pipelines and for years was forced to truck in heating oil to keep its buildings warm during the spring, winter and fall. The expensive fuel was a particular drain at the paint shop, which is ventilated continuously. Where possible, the mill has used wood heat to offset costs. An outdoor Central Boiler furnace fuelled by low-grade hardwood from the log yard heats the mill’s mechanic building. Recently Singor added two more value-added products – moulding/mill work and pre-finishing – which left a question about what to do with the residuals. “We had all this dry high-quality kiln-dried hog fuel: edgings, end-trim blocks, defect pieces,” Singor says. The hog was previously being added to the coloured mulch mix, but it was an arduous process. The solution was to use the hog for the mill’s heating system. Last year Ric Singor turned to Viessmann to supply a boiler system that would help the mill better utilize those residuals and keep costs low. 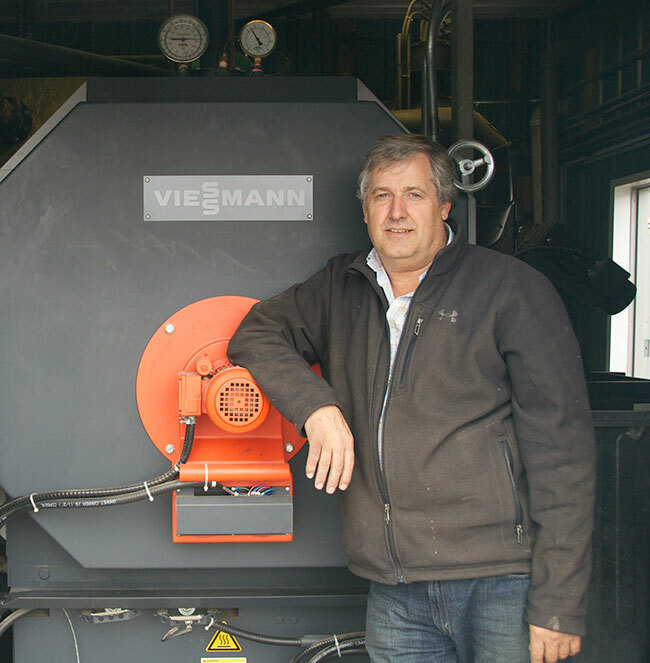 Viessmann installed a 220kW biomass boiler with a conveyor system to bring the wood residuals directly from the adjacent moulding and pre-finishing facility to a grinder and then into the boiler. The system includes a mixing valve and pump for the boiler, a Multi Cyclone to filter fly ash and bigger particulate out of the flue gas before it goes out of the chimney to reduce the emissions, and a 1,000 U.S. gallon thermal storage tank. 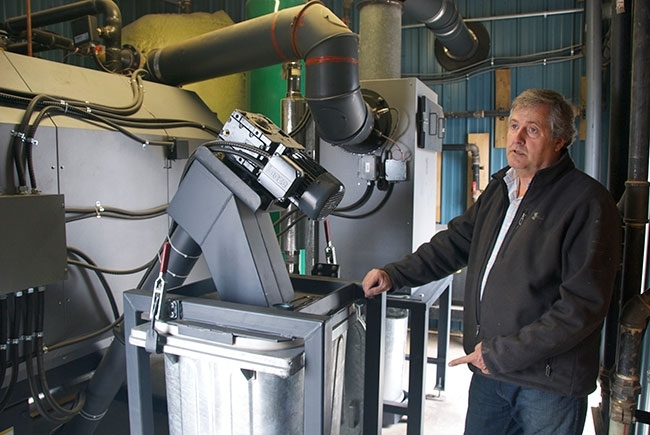 The wood boiler system is also expected to reduce the mill’s carbon output by 125.23 tons each year compared to burning oil, and 113.05 tons compared to propane. 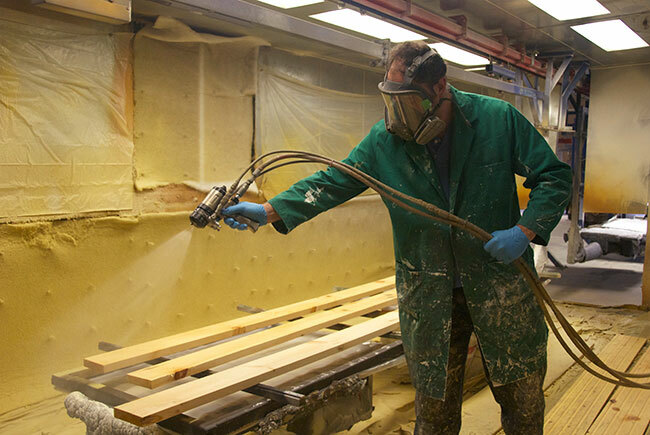 For Singor the true benefit of the wood boiler is having a system that uses the difficult-to-handle residuals from the mill’s pre-finishing facility. “That clean-up was a job that nobody wanted to do, now we just grind it and burn it,” he says. 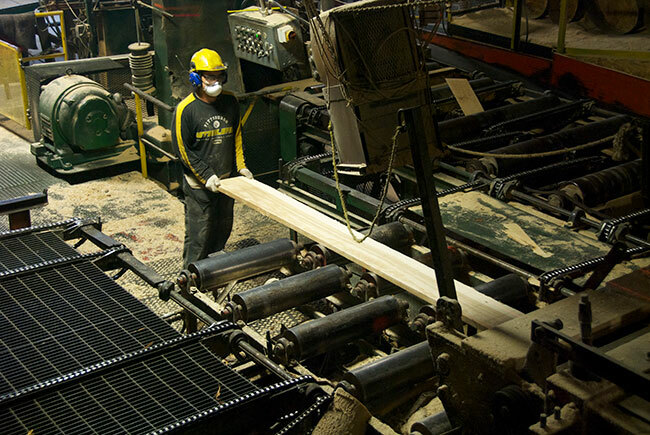 “As a company, we are not trying to increase production through the sawmill. We’re pretty happy with staying at our present level. For me the better area to spend our energies is on the value added side,” Singor says. A unique product for Muskoka Timber Mills is Timberthane – a polyurethane coating that is applied on exterior siding to make it durable. It’s an ideal product for cottage country, Singor says, with the best warranty in the business. For the mill that’s not afraid to dive into unexplored territory for the wood products sector, Muskoka Timber Mills is growing a name for itself that is reaching beyond cottage country in Ontario.